There’s magic in the name Alta. The Spanish word simply means "high," an apt description for Utah’s first lift-served ski resort. Alta Ski Area boasts 2,200 feet of vertical elevation gain from the old silver mining town at its base to the top of Supreme lift below the lofty ridgelines of Devil’s Castle and Mount Baldy. 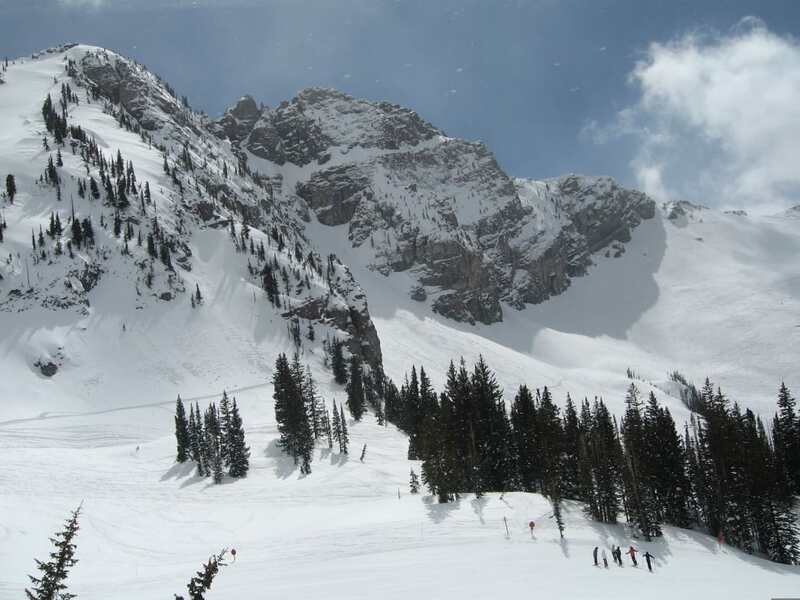 Alta is famous for its steep and deep powder snow, and challenging runs for expert skiers. Despite its big mountain skiing, Alta Ski Area is perfect for downhill family adventures with plenty of intermediate and beginner terrain, easy access from Salt Lake City, lots of lodging options, one of the country’s best ski schools, and views that stretch for miles. More Than 500 Inches of Snow! Why do families return to Alta Ski Area year after year? It’s the snow. An average of 551 inches (that’s 45 feet 11 inches) of powder snow piles up on Alta’s slopes in Little Cottonwood Canyon every winter. Skiers call it the best snow in the world. When you book a family ski vacation at Alta, even in March and April, you’ll never worry that there won’t be enough snow. Skiing Alta’s famous powder requires a different technique than simply carving turns down groomed slopes. Take a lesson at the Alf Engen Ski School—choose from a group lesson for your family or a private lesson—and learn how to ski the powder or take your skiing to the next level no matter what your abilities are. Then get out and practice your new skills. Albion Basin, with its huge variety of terrain, is ideal for learning to ski The Greatest Snow on Earth™. Take the Albion or Sunnyside lift on the lower mountain for beginner practice runs like Patsey Marley and Crooked Mile. Intermediate skiers can try the Race Arena and Blue Bell trails, while advanced skiers head down steep Vail Ridge, a powdery run through trees. Soon your family is ready to try untracked powder higher on the mountain. Take the Collins lift up first thing in the morning and traverse west into The Ballroom, an open bowl below Mount Baldy’s summit pyramid. If it just snowed you can make wide turns through pristine powder in the bowl, and then head down intermediate Main Street to Watson Shelter at mid-mountain. While many skiers think Alta Ski Area is all about black-diamond runs, the truth is that Alta is perfect for a family ski adventure with its wide huge variety of terrain. Yes, Alta has the reputation for extreme skiing, but two-thirds of the 2,200 skiable acres in Albion Basin and Collins Gulch caters to beginner and intermediate skiers. The mountain’s 116 runs are 25 percent beginner and 40 percent intermediate terrain, and 35 percent advanced, making Alta a great place to learn to ski. Alta offers an awesome ski school for kids and novice skiers that get them out on the slopes carving turns rather than snowplowing downhill. The Alf Engen Ski School is named for Alta's visionary who helped identify the area as a great place to start a ski area—and Alta's ski school director for 40 years. It features half-day and full-day programs for children older than four years old, as well as 45-minute lessons for kids as young as two. A fun family experience is taking a parent-child private lesson for kids younger than five. Almost all of Alta beginner runs are easily reached from the Albion lift in the Albion Basin on the lower mountain, letting the whole family practice their skills on wide, easy trails. Lead the little ones down fun green runs like wide Crooked Mile and Dipsy Doodle. Albion Basin's Supreme lift features more intermediate and expert terrain. Favorite intermediate runs include Big Dipper and Three Bears. Sugarloaf lift's Devil’s Elbow and Roller Coaster are great for challenging the intermediate skier. Both runs lead to Alf's Restaurant at the base of both the Sugarloaf and Supreme lifts. Warm up at Alf’s with their famous French fries and a bowl of chili or a cup of hot chocolate. The experience of riding Alta's new Supreme high-speed quad up to the top of Alta at 10,595 foot Point Supreme above Albion Basin is the place for the area's best mountain views. An escarpment of ragged mountain peaks lines the northern edge of Little Cottonwood Canyon, including Superior Peak, Flagstaff Mountain, and Mount Wolverine, while Twin Peaks and Mount Baldy tower to the west. It’s a dramatic view that you’ll still be talking about next summer. Experts head down steep No. 9 Express, Erosion Gullies, and Challenger on the west side of the lift, and the classic So Long down steep slopes with drop-offs, moguls, and deep powder on the east side of the lift. Once spring comes, don’t stop thinking about skiing. Think instead about spring skiing at Alta and get in some of your best runs of the year. Bring the kids and hit the slopes for classic skiing conditions with deep snowpack and stellar powder days because March is usually one of the snowiest months in the Wasatch Range. In between those epic storms, you’ll find warm, sunny days and you'll find warm, sunny days and skiers in crazy costumes. The whole family will be grinning from ear to ear. The party lasts until Alta closes for the season in late April or early May. You'll find great deals on lift tickets and lodging. Just don't forget to pack lip balm and sunscreen. Written by Stewart Green for RootsRated Media in partnership with Utah Office of Tourism.